Please can as many of us as possible come to this meeting at the Old Baths. This Handball Stadium is going to be here as part of our legacy. This means that we should all go & have a say about what we want it to be used for after the Olympic Games. If we don't get some great ideas going to the Olympic suits like Mother & Toddler Groups, Community Workshops, Local Basketball Touraments, Tea Dances, Youth Theatre Groups, Keep Fit Classes, etc - we will end up having some dodgy evangelical church sucking their congregation dry of money again! Please try your best to get down to the Hackney Wick Community Centre on Tuesday & make your voice heard. Oh yes - the Olympic people have a habit of only letting you speak if you get given the microphone. Please say as much as you want - as loud as you want - with or without a microphone. They are pretending to consult YOU. So make sure that YOUR voice is heard. This is OUR Community Centre - use it!! We all know what creative people we have here in Leabank Square. Some of the most musical, artistic, green fingered, sporty & delicious people in the world - live right here in Leabank Square! Now is the time to start getting some of the more interesting ideas shared amongst the whole of Hackney Wick. 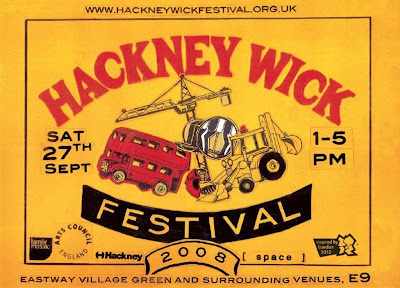 As you all know by now, the Hackney Wick festival is coming up on the 27th September!! We need to start thinking what Leabank Square is going to contribute to the whole festival. We need great recipes for a brilliant barbie on the green? We need fantastic volunteers who are great with kids & want to help them make crafty things on the green! We need the artists to start hanging their pieces all around Leabank Square (or in Hackney Wick in general)! We need gardeners to open up their gardens to show off to the rest of Hackney! We need sporty types to organise races around the green! We need face painters to get their make-up out & do brilliant animal designs on the whole of Hackney Wicks faces! We need all your old (& new) junk for the Giant Yard Sale - please see if you can contribute a bit of your profits to compost. We need marshals & Life-Savers on the Wharf for the Goodbye Bridge party!! We need ......... loads more ideas to discuss what we can do on this amazing day? Please start discussing any ideas - no matter how outrageous they may sound - anything you can contribute to the Festival will be amazing!! As many of you will be aware by now, Tom & Demi lost a wife & mother during the week. I am sure we will all send them our warmest condolences & kindest thoughts in this very difficult time for them. Tom asked to have a few flowers planted in her memory. She loved looking out over the canal from her balcony - and really seemed to enjoy the flowers all along our wharf. Tom & Demi - Karen may be temporary away from you - but we can all say hi to her each time we pass her flowers. You both only have to ask & we will all do anything to help. Now that’s a whole heap better!! I had a meeting with Georgia Sharpe, Richard Rook, Christian Nevercaughtsurname & Yvonne Folkes (from Hackney Council) about the Freedom of Information requests we sent off about the data from the noise & air pollution monitors. First of all – I must say that it was an absolutely amazing meeting. As it was informal – we could chat about a whole lot of things that 1 go on the microphone at a public meeting can’t address. I found Richard a very genuine, honest & straight person to deal with – and although I’m sure he will be far too busy as the construction starts getting more intense – I hope to have the occasional meeting over the next 4 years. Georgia & I have had our run-ins (as everyone who attended the residents meeting will know) – but – out of the office – out of a formal road-show meeting – she is absolutely lovely to meet with. I say this because I know that there is still resentment about meeting up with the PR dept – I genuinely think we could cut through all the spin & gloss with Georgia. Think about it. It was also great having Yvonne there to support us. This was a last minute arrangement & I was so glad she came as she made sure that the Olympic view was seen through us Hackney residents eyes as well. The main focus of the meeting was to discuss the data (my head was spinning after going through it all – good luck to all your Plane Stupid contacts) – but as they were in our flat – they could see & hear for themselves just what some of the residents have to go through. As soon as the data becomes available – any minute now – I’ll put what’s relevant up here. But – as we’ve said a million times over – this is the largest construction site in Europe – we are going to have noise – we are going to have dust – we are going to be inconvenienced – we are probably going to be upset – but after it’s all over – we are GOING to have the Olympics on our doorstep!! The best action point to come out of this brilliant meeting – is that we are going to be able to get regular local information about what’s coming to the Arena Fields part of the Olympic Site. This means that we should know about any developments - weeks before any major construction activities happen right across from Leabank Square. We have all moaned & shouted about how little & irrelevant information we are getting from the Olympics. Well – now Richard has set in motion a mechanism for getting this info. Please tell me just exactly what kind of information you would like to hear about in advance. What kind of construction activities would you be keen on knowing about well before they start? I will take these things to the next meeting here in Leabank Square next Wednesday – and hopefully we will all be able to move forward in a new partnership with our new neighbours. Take a look at these amazing lock-ups for cycles!! I am writing to Transport for London to see if there is any way for them to sponsor about twenty of these for us here in Leabank Square. I know that the residents in the houses are lucky enough to have your gardens to lock your bikes up - but the majority us us that live in one of the blocks of flats have to struggle up the stairs to lock our bikes somewhere in our tiny rooms. Sometimes we catch the walls with our tyres resulting in very dirty marks all the way up the stairs & along the corridor. This is Hackney - one of the highest cycle boroughs in the UK. We are the closest estate to the Olympic site. We have amazing cyclists right here in Leabank Square - so I will try my damnedest to get at least a set of 4 lock-ups for each block of flats - so that we can pull our bikes out at a moments notice & get cycling! !